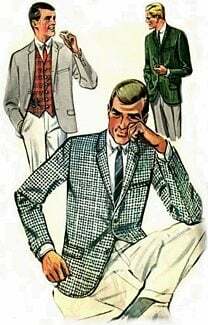 1960s Mens Fashion for men was not as revolutionary as it was for women but there was a lot of change. Ties, belts and lapels got wider, collars got longer and wider and a modified version of the bell bottom called “flared” became popular. The conserative men’s suit took on some geometric design along with the flare in the pants leg and wider lapels. Sport shirts were the norm for causal wear with the polo style being the most popular. 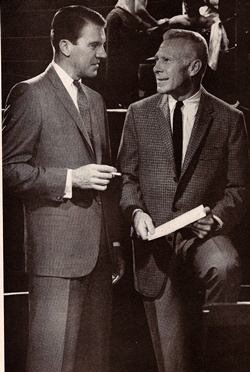 This suit perfectly illustrates the subtle changes in 1960s men’s fashion. Notice the wider lapels and tie. Also the jacket now has shoulder pads and the suit pants are flared. Even with the changes this would still be considered a conservative suit. The double breasted suit which was popular in the 30’s and 40’s made a brief comeback in the 1960s. Also called a ‘four button’ suit it was too stiff looking for the new casualness of the decade. Plaids and other patterns were now acceptable for a sports coat. 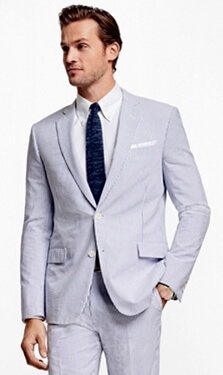 Even this solid color blue suit is much lighter in color than would have been worn in the 50s. Here is the opposite of the plaid sports coat. An outfit like this wouldn’t be worn by an executive in a large corporation but it would be just fine at most other jobs. 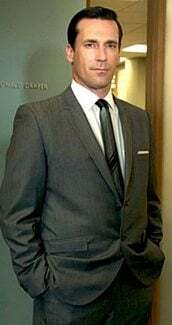 Sweater vests could be worn with a suit coat or instead of a coat. The one pictured here would be more appropriate for work however more casual sweater vests were much more popular. Notice the longer collars, flared pant legs and the use of geometric designs. All of these design elements were new in the 1960s. Knit shirts like the ones above came in a big variety of colors and designs. 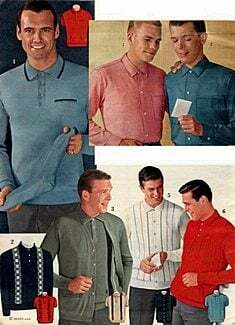 They paved the way for the more popular Polo style shirt which came a little later in the 1960s. Sweaters were popular in the 60’s. 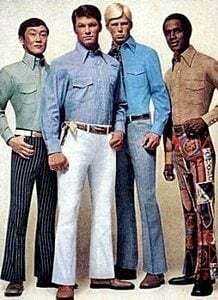 They bridged the gap allowing men to be casual yet still neatly dressed. 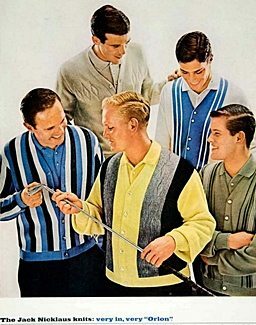 Pictured here is golf pro, Jack Nicklaus, showing his line of sweaters. The geometric design of this sweater imitated the Mod look that women’s clothes designers used so liberally. 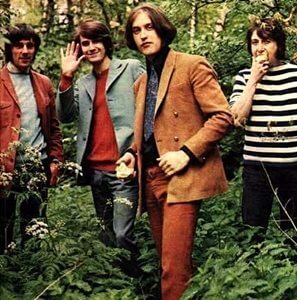 The Mod look did not catch on in men’s wear. 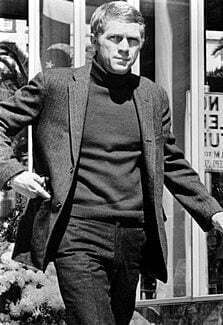 The 1950s had James Dean but the king of cool in the 1960s was Steve McQueen. The above pic is definitely how to dress casual in the 60s. 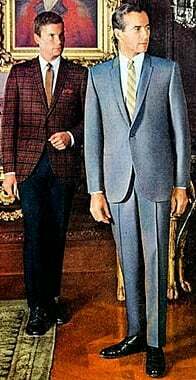 These tasteless generic suits actually gained more popularity in the 70’s but unfortunately they were a product of the 1960s. 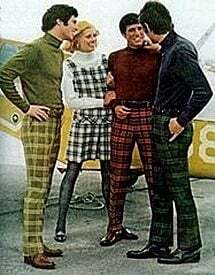 Although Mod designs never caught on in menswear, plaid designs in nontraditional colors were popular. Notice again the use of knit shirts to round out the casual look. This is an example of trying to make a regular suit more hip. It has a bold print along with relaxed styling and flared slacks. 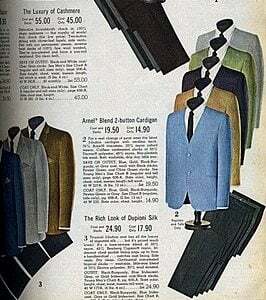 A 1960s Spiegel Catalog page showing the variety that men now had in their wardrobe choices. 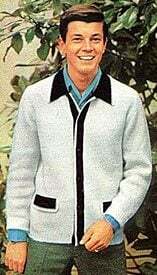 The Seersucker Suit was one of the 1960s more relaxed styles and a great choice to wear in the summer. 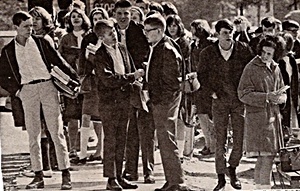 Mod wasn’t the only influence on men’s styles, the anti-establishment hippie movement was bringing with it an “anything goes” philosophy that allowed for greater choice in clothing. 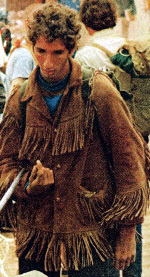 Hippie clothing influenced main stream style to a certain degree but it never caught on as an everyday men’s fashion. While the movie Easy Rider was showcasing hippie style the average school kid was still dressing very conservatively. 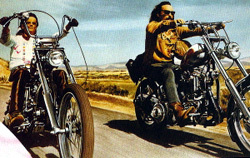 The movie Easy Rider was an anthem for hippie style. By the end of the sixties some fashions were here to stay, the flaired dress slack would remain in style for another decade ties and lapels didn’t skinny up for another 20 – 25 years either. But among the young crowd anything that was different from the norm was cool, hip and definetly groovy.